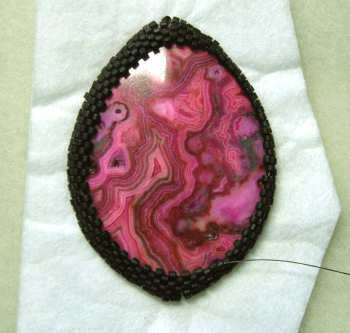 In the first installment of my bead embroidery project, I talked about the cab I had gotten that had some slight issues, and what I could do with it for a bead embroidery project. Here's right before the freeform portion started. If you follow my work at all, you know my first love is freeform projects. And this one started out…interestingly. 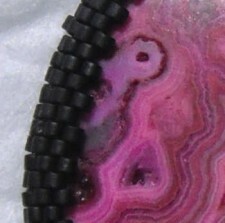 So, you can see in the photo to the right that I have begun making my bezel asymmetrically — I’ve added size 15 pink beads to the left side, but not to the right. 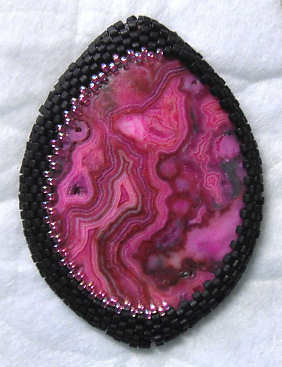 When beading freeform, you don’t always know where your beading will take you. And the first place it took me was….ummmm….interesting. I don’t mean to scare you, but here is how I started, before I ripped part of it out. This started out a little scary! That topknot was getting out of hand, so I took it out, but I kept the work I had done on the left side of the cab. 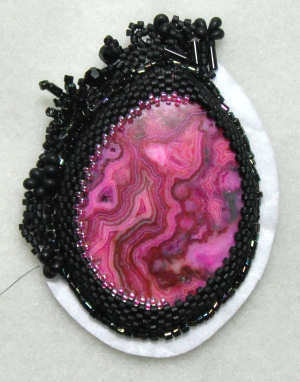 Freeform bead embroidery isn’t just willy-nilly putting beads on and calling it good. Why? Because it can get out of hand (like the topknot) and become unbalanced. And even though your project won’t be symetrical, it does need to have a flow of sorts. With that in mind, I continued on with the project, and it got to be fun again. Really, this looks much better in person (I am no photographer). I still stand by my wish to keep the eye drawn to the cab, so I am using black beads of different sizes, shapes and finishes. But I realized that I needed to throw back in a little bit of color, as it was getting a little too funeral-ish. So, I decided to add in some iris-colored beads, which unfortunately don’t show up very well in this photo. In case you’re not familiar with iris coloring, it’s an almost metallic look with shimmers of pink, gold, purple, etc. What shimmers/shine you do see in the photo to the right are the iris beads, but not all of them are showing up. Yep, I know this still looks a wee bit messy/unbalanced, but I am not done yet! Part of the process is getting the base done, then strategically placing other beads where they are needed. I don’t know if you do this too, but while I am working on one project, I am busily scoping out ideas for the next. Last post, I said I was going to do a little ebay shopping, and I did. I have quite a few cabs winging their way to me! 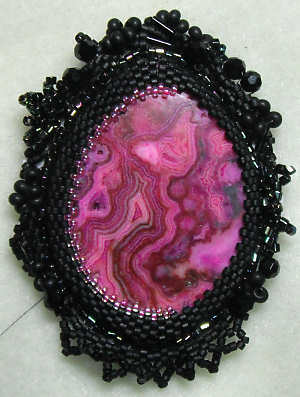 Meanwhile, here are some more interesting cabs to get your ideas humming while I am working on my next installment of this bead embroidery project.